The wire construction of this dump bin allows for your customers to easily view the items held within and is also highly durable. You also have the ability to separate the bin into 4 separate areas for easy organization. Casters also make moving this dump bin a breeze. 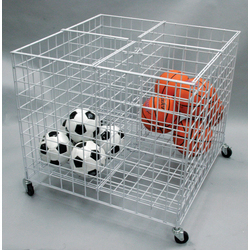 This items is ideal for separating large objects in one retail display.